U.S. Soccer Star Landon Donovan Fails To Make World Cup Cut : The Two-Way Donovan, 32, is the team's all-time leader in scoring and assists. Twenty-three players were named to the roster for the tournament, which starts next month in Brazil. 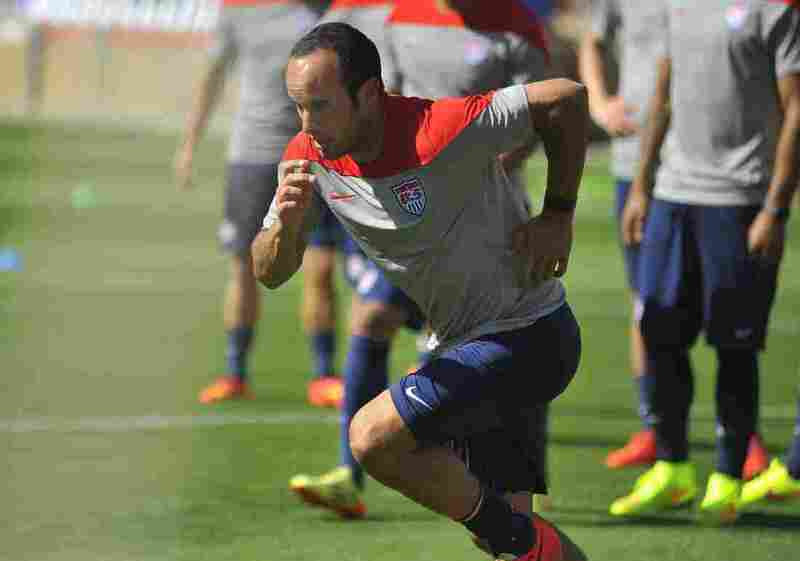 Landon Donovan practices with the U.S. Men's National Team in Stanford, Calif., last week. U.S. Soccer announced Thursday he had not made the roster for the 2014 World Cup in Brazil. Landon Donovan, the all-time leader in scoring and assists for the U.S. Men's National Soccer Team, will not be part of the 2014 FIFA World Cup roster in Brazil, U.S. Soccer says. ESPN writes: "Donovan, 32, has played for the U.S. in the past three World Cups dating back to 2002. He has been the face of the national team for most of the past decade, but spoke in recent months about how his body is no longer what it had once been." "After the Los Angeles Galaxy won the 2012 MLS Cup, Donovan stepped away from the game, citing a need for 'time where I can just pause, and breathe and rest, let my body heal, let my mind refresh,' he told ESPN at the time. He ended up missing the United States' first three World Cup qualifiers in 2013, and [manager Jurgen] Klinsmann didn't include him on the roster for the team's qualifiers in June. He returned to the team in September and had a goal and an assist in the Americans' 2-0 win over Mexico that clinched the World Cup bid." "It's an exciting moment when you have narrowed the roster down as a coaching staff, and these 23 players that you've chosen can focus now purely on Brazil," Klinsmann said in a statement announcing the roster. "We can go into more specific things about technical approaches, and about the opponents. For the players, it's very important to know that they are now part of it and they can relax and know they are on the list going to Brazil and taking it from there. After almost 10 days of work right now, we thought the point has come to make the decision," he said.